On the initiative of the European Union Affairs Committee, discussion of the migration policy of Estonia as a matter of significant national importance was held in the plenary assembly of the Riigikogu on Tuesday. The need for cross-party cooperation was stressed. Chairman of the European Union Affairs Committee Kalle Palling said that Estonia does not remain intact by the conflicts in the Middle East and Africa. “We must be able to contribute to the solution of this crisis as a state, in a cross-party manner, in solidarity with the rest of Europe. We should have value-based positions, and not political parties scoring points,” Palling said. Palling stressed Estonia’s position according to which all EU member states must participate in the resolution of the crisis proportionally, according to their abilities. Palling said that it is important to focus on helping the main African countries under the refugee pressure. He called to support the neighbouring countries of Syria, such as Jordan, Lebanon and Turkey, which have received millions of refugees. “In a longer perspective, it is important to promote the economy there and create jobs, in addition to humanitarian aid,” Palling said. He added that Estonia has supported the alleviation of the humanitarian situation of Syrian refugees with 1.8 million euro. The Minister of the Interior Hanno Pevkur said that an action plan for resettlement and relocation which provides for the necessary activities and the entities responsible for carrying out the activities has been drafted with participation by relevant ministries. “For better implementation of the decision, we have compiled a profile of the persons to be relocated. We wish to help people who wish to come to live here, and are able to adapt in Estonia and have motivation for that. Estonia would prefer to take in full families, as well as persons from vulnerable groups such as single parent families and unaccompanied minors or orphans,” Pevkur said. He added that, of course, these people must not pose a threat to the security of the Estonian state. Pevkur said that an agreement had been signed with Italian colleagues on 2 October, which allows our officials from the police, Security Police and the Ministry of Social Affairs to go to Italy in order to carry out procedural acts. “It will be for Estonia to decide whether a person will come to Estonia or not,” Pevkur stressed. According to the data of the Minister of the Interior, more than 3000 aliens from non-EU countries received an initial residence permit for settlement in Estonia last year. Chairman of the Estonian Refugee Council Eero Janson said that, over the next two years, Estonia will receive about 500 people who need protection within the framework of relocation and resettlement programmes. “Let’s be honest, this is a very small contribution in the context of the European and global refugee crisis,” Janson said. In his speech, Janson pointed out the principles to which greater attention should be paid when receiving refugees and in the Government’s action plan. In his opinion, the “selection” of refugees should be non-discriminatory as to the religion, skin colour and other characteristics of the people. “We must take into account the personal preferences of the refugees and their existing ties to a given country,” Janson said. He also attached importance to the knowledge of the Estonian language and using the potential of every refugee. “Settling refugees inside Estonia must be based first and foremost on the existence of jobs and school places, and the support network and language learning opportunities,” Janson said. 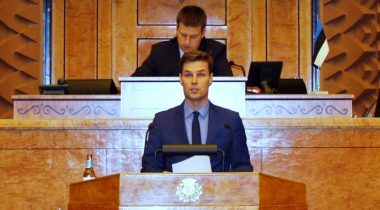 In his report, the Minister of Social Protection Margus Tsahkna presented twelve open proposals for development of a common policy. They included the continuation of the conservative immigration, language and citizenship policy of Estonia, the addressing of the root causes of the migration crisis, the establishment of effective control over the external borders of Schengen, the requirement of the right of Member States to decide for themselves on immigration policy, and the reviewing of the European Union’s financial instruments to mitigate the effects of the refugee crisis. Tsahkna proposed to establish a quota for receiving refugees by law, and to establish both in Estonia and in the European Union a list of “safe countries and regions” the citizens of which do not need protection or asylum. Tsahkna’s proposals also concerned the ensuring of border control capacity on the external border of the EU, consideration of Estonian cultural space and traditions, and an adaptation programme for persons who have received international protection. Also, the granting of a residence permit to persons who have received international protection, and returning them to their home countries after stability has been achieved there. Valdo Randpere, Mart Helme, Mihkel Raud, Mart Nutt, Mailis Reps, Monika Haukanõmm, Peeter Ernits, Aadu Must, Mihhail Stalnuhhin, Laine Randjärv, Martin Helme, Jaanus Karilaid, Jüri Adams and Jaak Madison who took the floor during the debate presented their positions on migration policy issues.